Super easy, delicious and full of SPRINKLES!! Preheat the oven to 375 degrees F. Grease and flour a cupcake pan. In a bowl mix the butter, eggs, water, vanilla, cinnamon and baking powder. Slowly add the flour and the sugar mixing well with a rubber spatula until everything is incorporated. 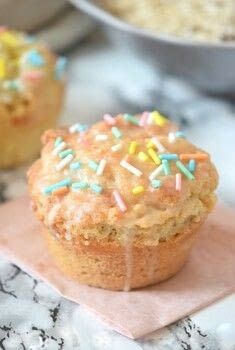 Pour the batter, with the help of a spoon, in the cupcake pan. Do you have a recipe for the vanilla glaze? These look delicious.